A little over a year ago I mentioned a paper published in MSB on how drug-combinations could be used to study pathways. Recently, some of the same authors have now published a study in Nature Biotech analyzing drug combinations under different contexts (i.e. different tissues, different species, different outputs, etc). The underlying methodology of the study is essentially the same as in above mentioned paper. The authors try to study the effect of combining drugs on specific phenotypes. One example of a phenotype could be the inhibition of growth of a pathogenic strain. 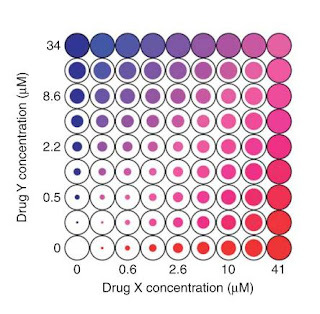 Different concentrations of two drugs are combined in a matrix form as described in figure 1a (reproduced below) and the phenotype is measured for each case. Two drugs are said to be synergistic if the measured impact on the phenotype of the combined drugs is greater than expected by a neutral model. The authors ask themselves if drug synergy is or not context dependent. This is an important question for combinatorial therapeutics since we would like to have treatments that are context dependent (i.e. specific). The most straightforward example would be drug treatments against pathogens. Ideally, combinations of drugs would act synergistically against the pathogens but not against the host. Another example would be drug combinations targeting the expression of a particular gene (ex. TNF-alpha) without showing synergy at targeting general cell viability. In order to test this the authors performed simulations of E.coli metabolism growing under different conditions and a astonishing panel of ~94000 experimental dose matrices covering several different types of therapeutic conditions. In each experiment, two drugs are tested against a control and a test phenotype and the synergy is measured and compared. The results are summarized as the synergy of the two drugs in the test case and the selectivity of this synergy towards the test phenotype. In other words, for each experiment the authors tested if the synergistic drug pairs in the test phenotype (ex inhibition of growth of the pathogen) are also acting in synergy on the control phenotype (ex. inhibition of growth of host cells). I reproduce above fig 2b with the results from the flux balance simulations of E.coli metabolism. In these simulations "drugs" were implemented as ideal enzyme inhibitors that reduced flux of their targets. Each cross on this figure represents a "drug" pair targeting two enzymes of the E.coli metabolism. The test and control phenotypes are, in this case, fermentation versus aerobic conditions. 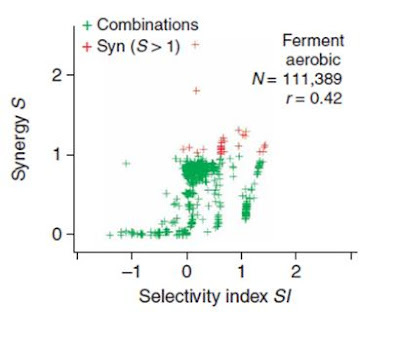 In this plot the authors show that synergistic drug pairs under fermentation tend to have a high selectivity for that condition when compared to aerobic conditions. The authors then went on to show that this was also the case for most of the experimental cases studied. Some of the experimental cases included cell lines derived from different tissues, highlighting the complexity of drug-interactions in multicellular organisms. These results are consistent with the observation that negative genetic interactions are poorly conserved across species (Tischler et al. Nat Genet. 2008, Roguev et al. Science 2008). Although these results are promising, in respect to the usefulness of combinatorial therapeutic strategies, they emphasize the degree of divergence of cellular interaction networks across species and perhaps even tissues. I am obviously biased but I think that fundamental studies of chemogenomics across species will help us to better understand the potential of combinatorial therapeutics. There are several examples in this paper of specific interesting cases of drug synergies but most of the results are in supplementary materials. Given that most of the authors are affiliated with a company I expect that there will be little real therapeutic value in the data. Still, it looks like an interesting set for anyone interested in studying drug-gene networks.